I’m on a list to buy an Aussie puppy in October. While I’ve had 5 dogs in my life none have been Aussies. The puppies will be AKC registered as both parents are but since I’m first on the list I need to know what to look or lookout for when choosing the dog. I’m aware of eye and ear problems but I believe the breeder has done it right. I’ve heard the dogs can change color from the puppy stage to adults — any truth to that? I’ve also heard that the double coat isn’t always the case, some of the red bi colored dogs may have less of it than others — any truth? Temperament is important to me as I have two grandchildren age 4 and 8 who will want to help raise the dog although they won’t see the puppy on a regular basis. I would want the least active female — what should I look for? Hi I’m on my second Aussie they are great with kids, loyal playful. Aussies do shed and a thin coated Aussie would catch my attention to being maybe a health issue. I believe all Aussies have a double coat. My children were 8 and 10 and grew up Jake. . I could never get another breed at this point due to the roll they play in the family. Exercise is extremely important and being part of all you do with your family will make your family complete. 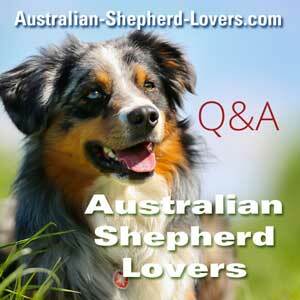 I am on my forth Aussie and I love the breed. They are super smart and eager to learn. They need a lot of exercise. My husband takes them to the dog park every day. I have a three year old grandson who helps training our new puppy. Enjoy your puppy. We have had three Aussies and I can't say enough about their intelligence. All our Aussies have been females. I would suggest you try to find out about the temperament of the parents. If your puppy grows up with the grandchildren and/or with children around them, they will be more tolerant of the children's exuberance as they are definitely herders and an active breed needing lots of exercise. Also be sure to see to your Aussie engaged in training. This way you can see how wonderful they are in response to it. Good luck and I hope you have as much enjoyment with your new puppy as we have had with ours. I have had many dogs in my life but my first and only Aussie which recently passed was just like me. Duke or (Dukie) was my BFF. He would read my mind and snicker at me. He had a different face for every mood and he would tease me and made me laugh. Dukie would sleep with one eye slightly open to make sure I was still there. We would sit in the grass after mowing and talk about everything, he loved my stories. Dukie would help me fix things around the house and I swear he would know how to do it if I was busy. We listened to owls and watch hawks fly above, chase chipmunks and a bird or two in flight. At 70 my heart is broken forever. I gave Dukie the best of everything and he gave to me his all.